And now we’ve skydived (skydove?) headlong into the first day of Obligatory Ice Level Day, like a rocket screeching into a vat of shampoo! Of course, we got to start off big. We got a long road to travel before we reach our Pokémon Retrothon! We’ll need to work hard to get there. We’ll need… DETERMINATION. That’s why the first Ice Level of the year is Snowdin, from Undertale! Oh please, you knew this was coming. Undertale finally unseated Yoshi’s Island as my all-time favorite game, which is pretty nuts. I just had to show it some love! 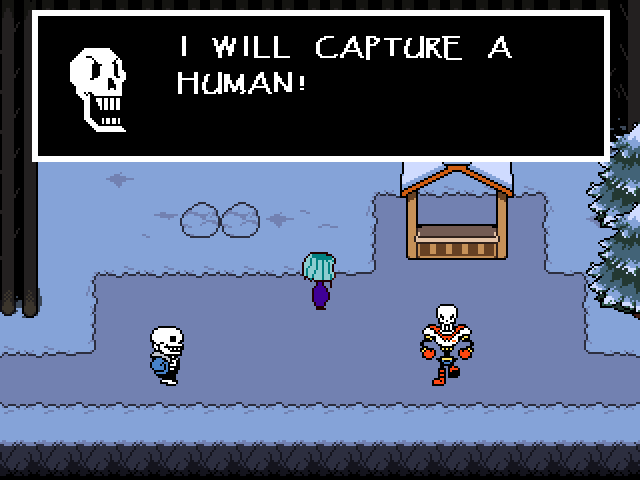 In Undertale, you play as a human who has ended up trapped in the underground kingdom of the monsters. It’s a goofy, crazy romp that tugs at your heartstrings about as often as it yanks the rug out from under you, let me tell ya. In every fight you have two options… find a way to show mercy and spare the monster that’s attacking you, or just overpower and kill it yourself. Are you going to befriend every creature you meet, or slaughter them just to see what happens? The choice is yours, after all. – Pet the doggies. Pet them as much as possible. – Help a snowman out, ok? – No, not a “bicycle”. 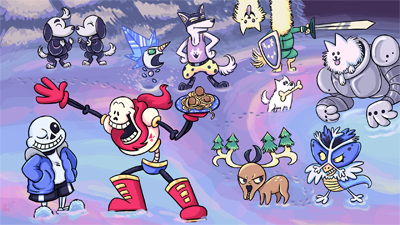 “NYEH-HEH-HEH!” “good one, bro” Get the full wallpaper HERE! YES! After a few years of having zero time to do full wallpapers, I finally managed to make some this time! So yes, this year you’re getting a ton of new HD wallpapers for your icy needs. Huzzah! But anyway, time for the next part of these OILD posts. That’s right, the music! Undertale’s soundtrack is fantastic, and Snowdin’s no exception. Snowy plays as you’re walking in the Snowdin forests, Uwa!! So Holiday also plays in the area, and Snowdin Town plays in, well Snowdin Town! And of course in addition to original music, we have some remixes! String Player Gamer’s Snowy cover is such a pretty take on the original song, and totally worth a listen. TheEternalSushi’s Snowdin Town Dance Remix is cheerful, bouncy and really captures the holiday feel of the town. Kiseki’s Snowdin Town Carol also gets into the spirit of both the season and Undertale itself, adding caroling lyrics that are equally cute and silly.